Mariam Hussain - National TalentS Co.
Mariam is a Senior Creative Learning Content development associate at National TalentS™ Co. (TalentS™). She has experience in designing and developing various educational contents; as school curriculum for k-12, learning activities for public workshops and designing CSR programs. Mariam has participated in designing and developing content for Robolympics and RoboSports CSR programs, in which students build and program robots to imitate certain sports in a competition theme, based on her prior experience in programming she has developed a simple programming language that beginner kids can use to program robots in the competition. 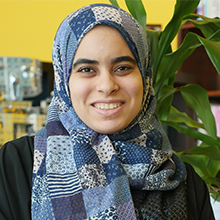 As a firm believer in the constructionism learning theory and the importance of teaching kids programming and critical thinking, Mariam has worked on developing content for creative computing(Scratch), Electronics and Microcontrollers (Arduino) and Robotics using (LEGO MindStorm NXT,EV3, VEX and Tetrix). Mariam’s experience extends to project management where she ran the First Tech challenge (FTC) competition for the first time in Saudi Arabia for girls. She has a bachelor degree in Computer Science from Ain Shams University, 2008 and currently pursuing a degree in curriculum, instruction and assessment at Walden University. Before joining TalentS™ she worked for two years as Software and Web developer at iSource Global and prior to that Via Technology.